Taylor: "One is the loneliest number that you'll ever do. Two can be as bad as one, it's the loneliest number since the number one." Taylor: "No is the saddest experience you'll ever know. Yes, it's the saddest experience you'll ever know... 'cause one is the loneliest number that you'll ever do...."
Julius (suddenly): "IT'S JUST NO GOOD ANYMORE SINCE SHE WENT AWAYYYYY... now I spend my time just making rhymes of yesterday..."
Taylor: "one is the loneliest..."
Taylor: "ONE is the loneliest number that you'll ever..."
Lucifer: I'm from the Office of Animal Affairs. Lucifer: That male is to be transferred to the zoo. Julius: At this hour? Who says so? Julius: Stop making speeches and show me the order! Julius: Huh! This order's no good... it must be countersigned by Dr. Zaius! Taylor: Whoa... don't you think he's had enough... who the hell are you, anyway? Lucifer: So you CAN talk! I didn't know if you really could or if I was freakin' from the acid I dropped just before I came in here. 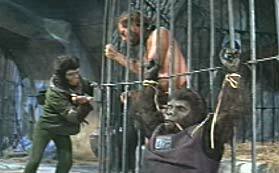 I'm Dr. Zira's nephew...this abduction was her idea. You're not really going to the zoo... that's just our story in case somebody stops us. I like torturing horses. Taylor: Get me out of this! Taylor: She comes along, too. Lucifer: Zira doesn't want your female! Lucifer: If you insist... but I'm NOT taking any orders! Hey... did I mention that I like to torture horses? Taylor: All right... come on, let's go! Zira: I told you not to bring the other one! Lucifer: He wouldn't leave her! Taylor: Don't you have any other clothes for me? Lucifer: What do you expect... an ape's new suit? Taylor: This outfit is stupid! Zira: Well, so are you... like all men. 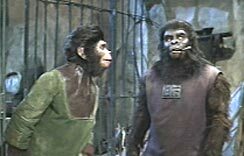 Taylor, remember, all men look alike to most apes... so put it on and keep quiet and we may just get away with this! Hurry! Taylor: HEY! You two get a room! Come on! Who duct-taped the door shut? Let me out of this! Taylor: OK, listen up... I'm gonna need some clean socks, TX-9, a 5 pound sack full of rope cut into 3 inch segments, a turtleneck sweater with the sleeves cut off, a phonograph needle, some' get well soon' cards, a red and white cheerleading pom pom, some lighter fluid, a turquoise ankle bracelet, a dozen manilla envelopes, and some pancake mix. Lucifer: What can I do? Taylor: I want you to stay away from the horses, you psychotic freak. Taylor: Do you have any weapons... any guns? Cornelius: The best... but we won't need them. Taylor: I'm glad to hear it... I want one anyway. Cornelius: Now look here, Taylor, I'm in charge of this expedition! Taylor: Good for you! But you're not in charge of me... not any more. I don't plan to be caught again. Cornelius: But we defended you... helped you escape... we put our reputations on the line and now we're fugitives like you! How can you turn on us like this? Zira: We GET the message, Taylor. Taylor: You got something to say to me, Monkey Man? Cornelius: As you wish... you big doo-doo head. Zira: "Doo-doo head'? That was your best shot? Really, Cornelius! 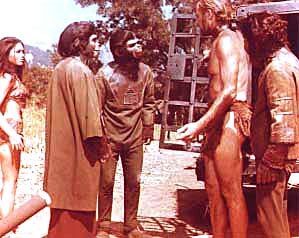 Taylor: Anyhoo, Dr. Zaius seemed to think there was another jungle beyond the Forbidden Zone. I'll try for that. What about you? 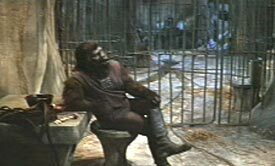 Zira: Cornelius and I have been indicted for heresy. Unless we can prove our theories, we don't stand a chance of acquittal. 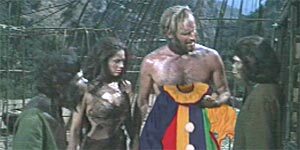 Taylor: You're going back to the Forbidden Zone? Cornelius: We're going back to the diggings I worked at over a year ago. It's a three day ride across the desert... and near the place where you claim you landed from that planet of yours. Taylor: Still don't believe me, do you? Cornelius: It's a long detour to Dead Lake... what would we find? Taylor: Nothing much... an empty rubber life raft, empty snack cracker boxes, some stained underwear, maybe a little flag... the emblem of my countrymen. Taylor: I said FLAG, crackhead! Cornelius: The terrain around that lake is poisonous. There's no fresh water, no vegetation... nothing. Taylor: Well... anyway, I ought to thank you for saving me... you'll be in trouble for that. Zira: We've been in trouble since the moment we met you. Zira: What's she pointing at? Taylor: Nova, no. Nova, Nova... not right now... it's not safe! Nova! I'll get you a souvenir later... I promise! Cornelius: You're not going to get her anything later, are you? Zira: Yeah, OK... well... we'd better get started. If the mounted police pick up our trail, they'll come this far at least. Cornelius: Right... let's get the water and provisions into the wagon. R A W H I D E !!!! " Taylor (shouting across chasm): Cornelius! Where does this river lead to? Cornelius: It flows into a sea some miles from here! That's where we'll find the diggings! Cornelius: I don't know. You can't ride along the shore at high tide... and we had no boats on our last expedition. 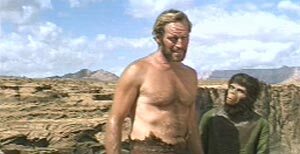 Taylor: You never told me... why do you call this the Forbidden Zone? Cornelius: No one knows. It's an ancient taboo... set forth in the Sacred Scrolls. The Lawgiver pronounced this whole area deadly. Taylor: I bet I could... oh, never mind. Cornelius: You bet you could what? 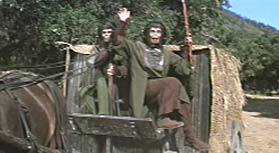 Taylor: I was going to say that I bet I could jump over this chasm... but I don't want to show off in front of you apes. Cornelius: Are you implying that an ape couldn't do it? Taylor: Well... yes, but... nah... let's just forget I mentioned it. 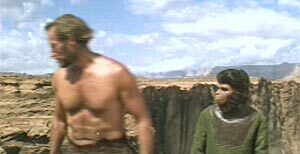 Cornelius: Apes are superior to man and I can prove it! Lucifer: Shouldn't we be moving on? Cornelius (echoing from bottom of chasm): Hey everybody, I'm, OK! Hello? HELLO??? ?